"I AM AN ECOLOGIST FIRST, AND ARCHITECT SECOND." Ken Yeang has an international reputation as a pioneer in the development of ecological (sustainable), bioclimatic (climate-responsive) buildings. 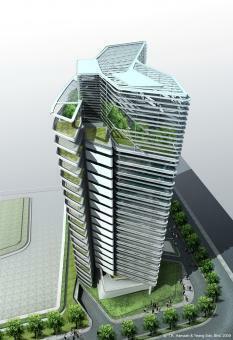 The high-rise building type has undergone major design developments since it first appeared more than a century ago, and Yeang, together with his business partner, Tengku Robert Hamzah, have been instrumental over the past 20 years in introducing an entirely new genre - in particular, the 'green skyscraper', besides other building types. Their international architects' firm, Hamzah & Yeang, headquartered in Kuala Lumpur, Malaysia with offices in London, UK, and China, has been the focus of this avant-garde work. Ken Yeang explains the philosophy underlying his work as follows: "We have to build in harmony with the natural world. Our goal must be not simply to slow the present rate of environmental impairment, but to eliminate it entirely. For example, we need to ensure that all industrial wastes are not just reused, but recycled naturally, flowing integrally back into the environment through ecosystem-based processes. We must work towards green ecoinfrastructure, serving ecocities, and design buildings as living systems." 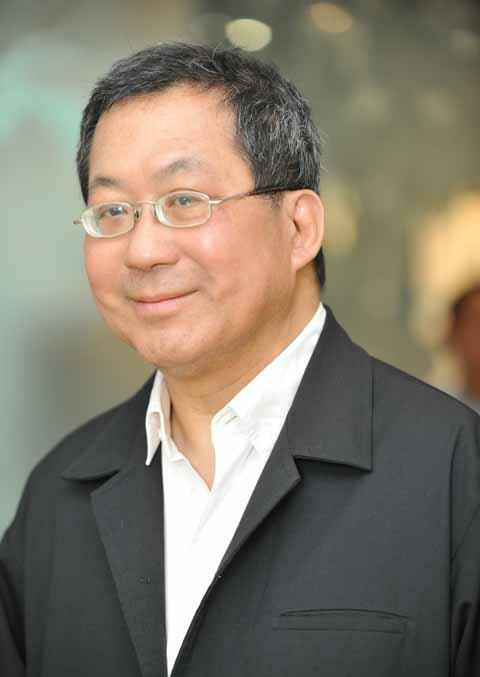 Ken Yeang is one of the leading architects and theoreticians in the field of green design. He started applying ecological considerations to architecture and town planning in the 70s, in his PhD dissertation at the University of Cambridge – later published as ‘Designing with Nature’ by McGraw-Hill in 1995. He is the author of several key books on ecoarchitecture and ecomasterplannning, besides being credited for inventing the idea of the green climate-responsive skyscraper, elucidated in his book 'The Skyscraper, Bioclimatically Considered : A Design Primer' (1996). His oeuvre of work is encapsulated in a recent book by Sara Hart entitled 'Ecoarchitecture - The work of Ken Yeang' (2011). The British newspaper The Guardian refers to him as "one ... of the 50 people who could save the planet." His signature green buildings and ecoskyscrapers have verdant greenery with a hirsute aesthetic, in which their dwellers live and work in harmony and in comfort inasmuch as possible with the natural environment. The Malaysian architect's work offers solutions to contemporary dwellings and workspaces, in the ever-intensifying metropolitan urban environment. He argues that biointegration with nature by design is vital because humans can only live a healthy life if they live in a healthy environment. "Humans are responsible for 99 per cent of pollution,” he explains, “whereupon the seamless and benign biointegration of our built environment with the natural environment must be the fundamental basis for the design of all human-made artifacts. Ecological considerations must inevitably become integral part of the design of all of our artifacts, structures and infrastructures. The idea behind this thinking is that environmental problems would not exist at all but for the callous impact of our modern society. 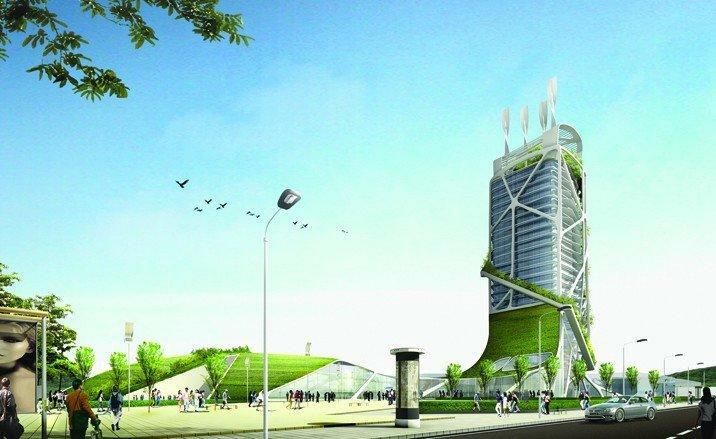 Hamzah & Yeang have built more than a dozen bioclimatic ecological high-rise buildings and several thousand ecological terrace houses, that start as passive-mode armatures for green design. An important aspect of his work is 'ecomimicry', a concept which he developed from bionics and biomimicry in an approach where designing seeks to imitate the attributes and properties of ecosytems to address complex environmental issues. "We must base our designs on natural principles," he says "and not give way to the delusion that modern technogy is superior to nature, which has developed through billions of years of evolution. We must imitate the properties, structures, functions and processes of natural ecosystems." In a similar vein he says: "Ecodesign applies not just to how we design, construct, use, recycle and eventually integrate our built systems back into the natural environment, but to everything we humans make - buildings, bridges, roads, toys, refrigerators, clothing, etc." Hamzah & Yeang have received over 40 awards in recent years, including the Aga Khan Award for Architecture in 1995 (for the Menara Mesiniaga skyscraper), the RAIA (Royal Australian Institute of Architects) International Award (in 1997 and 1999) and the Dutch Prince Claus Award in 1999 for his design of green buildings. They were also awarded the Merdeka Award in the 'environment' category from the Malaysian government in 2011, which is regarded as the national equivalent of the Nobel Prize. After a career of 40 years Ken Yeang is best known for his work on the ecological design of tall buildings and other building types. His firm's early work pioneers the passive low-energy skyskraper. In his book 'The Green Skyscraper - The Basis for Designing Sustainable, Intensive Buildings' he sets out a strategy for sustainable design and for understanding the decisions that need to be made in the design of a complex building such as the skyscraper. In this book Yeang presents a general framework for looking at ecological design. Ken Yeang emphasises that ecodesign concerns not just those in the design community, but all whose roles in the global economy impact on the environment - resource extraction and production, manufacturing, the food industry, big business, transportations and others. He says, "...if we are able to biointegrate all that we make and all that we do with the natural environment in a seamless and bernign way, then there will be no environmental problems whatsoever." Ken Yeang started his career in 1984 with the design of his own residence, the well-known Roof-Roof House built at the outskirts of Malaysia's capital Kuala Lumpur near a rubber plantation. It was his first experimental climate-responsive work. 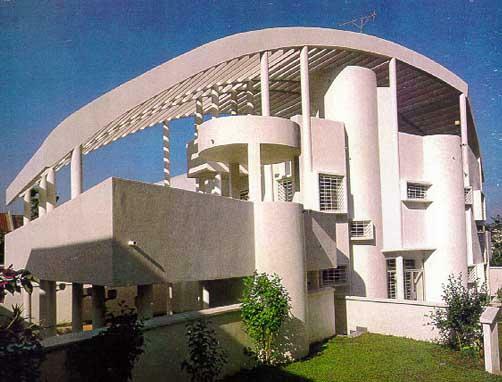 The house was his first attempt to implement his bioclimatic ideas and an early development of the concept of 'filter architecture', where the building's enclosural system operates as a filter between the inside and the outside attenuating the internal environmental conditions. Malaysia's tropic climate and location are near the Equator with intense solar radiation that create uncomfortable conditions at certain periods during the day. The Roof-Roof House ( a house with literally two roofs) was designed to serve as an environmental filter providing shade, ventilation and protection from inclement weather optimizing cross-ventilation and using evaporative cooling while controlling humidity. In Yeang's design for the Roof-Roof House he regards cultural factor in a link with the climate of the locality typifying a 'critical regionalist' approach to architecture. The residence incorporates several experimental ideas within a single built form, it has a dramatic curved louvered upper-roof structure as an umbrella-like environmental filter, that functions as a solar-filtering device and a shading canopy over the building's lower roof terrace. The large louvers are angled to let in the easterly morning sun, but to keep out the hot-mid day and western sun. The house has side 'wind wing-walls' at the south to direct wind into the dining area. On the east side is a swimming pool that functions as an evaporative cooling device to the prevailing easterly breeze before it enters the adjoining internal living spaces. The many climate-responsive features of this building makes it a prototype for his later design work. The Spire Edge Officer Tower (2013) stands as an iconic landmark on a new IT park, in Delhi, India. The tower received the LEED platina rating. Following the Roof-Roof House, Yeang started to look into designing the high rise typology in the 1990s as 'vertical green urbanism'. He sought to reinvent the skyscraper typology as from of 'vertical urban design'. He realized these ideas for high-rise in 2005 in the National Library of Singapore. Yeang inverted the concept of high-rise buildings with homogenous internal uses into what may be called a 'city-in-the-sky', or 'vertical urbanism', while integrating the advantages of urban design at the horizonal plane into the vertical dimension as a concept for high-rise design. With the increasing world's population in mind. 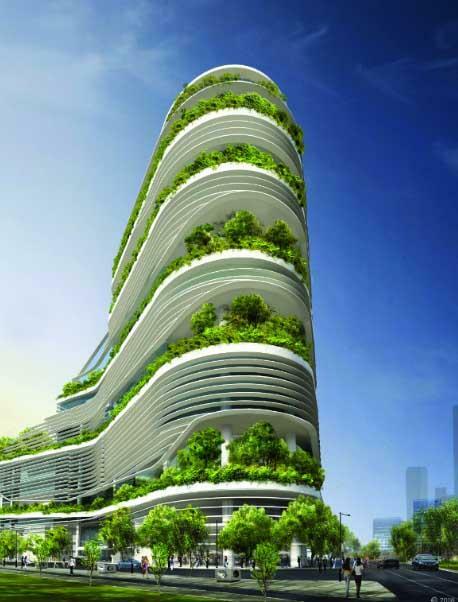 Yeang wanted to refute that skyscrapers have a negative effect on the environment and sought to make them more humane and green, vertically more complex and bioclimatic. Yeang further developed new climatic-responsive technical devices to find the right balance between appropriate efficient use of the buildings systems to save energy. Key projects designed by Yeang include the high-rise National Library Board Building in Singapore, Solaris (Singapore), DiGi Data Centre (Malaysia), Ganendra Art House (Malaysia), Great Ormond Street Children's Hospital Extension (under Llewerlyn Davies Yeang, UK), the Genome Research Building (Hong Kong with Andrew Lee King Fun & Associates), the 40-storey Eco-Tower at Elephant & Castle and the 15-storey Menara Mesiniaga, both in Malaysia. The 15-storey National Library in Singapore is situated in the heart of Singapore's arts, culture, learning and entertainment hub. The design of the library building received the Green Mark Platinum rating from the Building and Construction Authority in Singapore. The library was designed to be a destination for the people of Singapore to provide an open, hospitable and conductive learning environment. One of the principles was to be a national and civic institution, with a distinct character, reflecting Singapore's multicultural heritage and its aspirations to be a learning nation. Yeang's intention was to create a state-of-the-art library in the tropics that will be an icon for the region. The passive design features that were integrated are: daylighting using light shelves, good solar orientation and configuration, adequate sunshading, good cross natural ventilation, solar responsive façade design, use of appropriate building colour and vertical landscaping with large multistory sky-courts. These elements were assembled together into a collective strategy for low energy, high comfort and pleasurable learning spaces for users. The Solaris building has an 'ecocell', a green integrative device first presented in Ken Yeang's masterplan for Kowloon Waterfront masterplan in Hong Kong. Solaris designed in cooperation with CPG Consult, has side 'rain-check' glazed-walls at the ground floor's façades facing a non-airconditioned space, and a central atrium with operable glass-louvres over the atrium with sensors that automatically open and shut the louvres when required to ventilate the atrium and the ground floor. 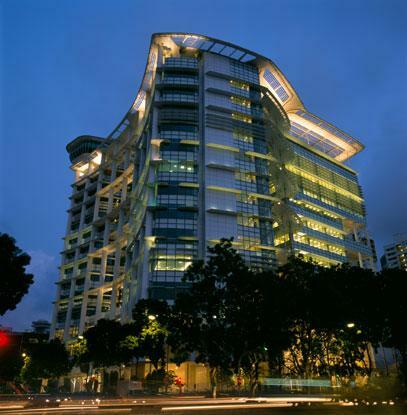 Solaris, located in Singapore's Fusionopolis hub, received the BCA (Buildings & Construction Authority) Green Mark Platinum rating (2012), the highest possible level for sustainable buildings in Singapor. Juror Robert Pratt says: "Ken Yeang's work continues to explore notions of buildings that are far more natural and non-traditional in our hermetically sealed world." Solaris' roofs are landscaped to enhance biodiversity and to provide insulation and to reduce the radiation of the sun light.